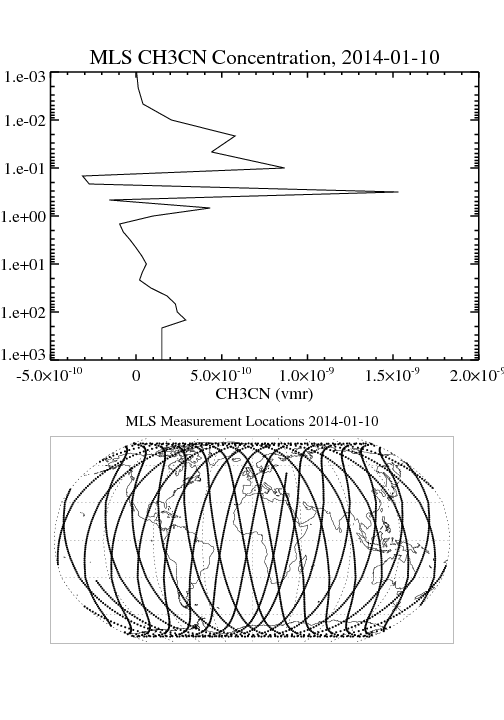 ML2CH3CN is the EOS Aura Microwave Limb Sounder (MLS) standard product for methyl cyanide derived from radiances measured by the 640 GHz radiometer. The data version is 3.3/3.4. Data coverage is from August 8, 2004 to June 30, 2015. Spatial coverage is near-global (-82 degrees to +82 degrees latitude), with each profile spaced 1.5 degrees or ~165 km along the orbit track (roughly 15 orbits per day). The recommended useful vertical range is between 46.4 and 1.0 hPa, and the vertical resolution ranges between ~5 km in the lower stratosphere and ~10 km in the upper stratosphere. Users of the ML2CH3CN data product should read section 3.4 of the EOS MLS Level 2 Version 3.3 and 3.4 Quality Document for more information. The data are stored in the version 5 EOS Hierarchical Data Format (HDF-EOS5), which is based on the version 5 Hierarchical Data Format, or HDF-5. Each file contains one swath object (profile data), with a set of data and geolocation fields, swath attributes, and metadata.